I have some exciting news: I’m officially a New Yorker! According to conventional wisdom, a resident earns the right to call him- or herself a New Yorker after living in the city for a consecutive decade. My 10th anniversary was just a few weeks ago, on September 26th. That was the first day of my magazine internship in 2004. I was terrified and bright-eyed that first sunny morning, arriving at work nearly 40 minutes early. In that time, the city has kicked me around, picked me back up, consoled me, gutted me, loved me and inspired me. I often compare living in NYC to being a teenager–all of your feelings about the city are amplified to an almost unbearable level; the highs are deliriously high, while the lows are crushingly low. No one is blasé about this place. In order to celebrate my time in this great city, I’ve compiled a list of my favorite places, memories and foods from the past 10 years. Favorite Memory: As far as nights out go, both my bachelorette party and recent 30th birthday at competing Russian supper clubs Rasputin (now closed) and Tatiana were insanely fun. 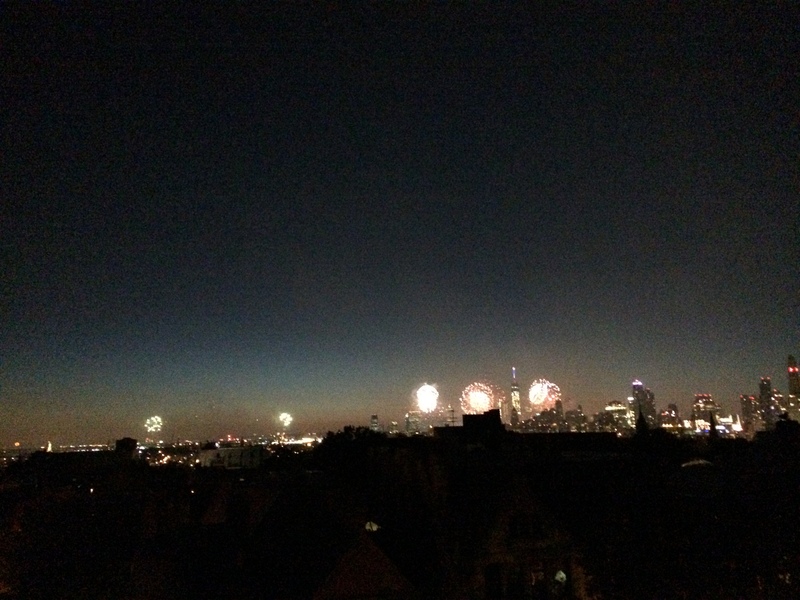 On a more sentimental note, it’s hard to pick a favorite inspired memory, but most recently, I remember my husband and I standing on our tarred (unauthorized) Brooklyn rooftop on the Fourth of July, watching dozens of fireworks displays from as far away as central Jersey. We could see other people standing on their roofs and hear the echoes and cheers from our neighbors all over the borough as the fireworks started over the Hudson. The city felt incredibly small at that specific moment. Favorite Thing I’ve Eaten Recently: The brisket at BrisketTown. Best Pizza: This is actually a three part question. Whole New York-style pie: Guiseppina’s. Slice: Prince St. Pizza for square Sicilian-style slices and Joe’s for traditional. Neopolitan pie: Franny’s and Don Antonio. Best Bagel: Absolute Bagels and Murray’s Bagels. If I want a great smoked salmon sandwich, Russ & Daughters. Best Burger: Reynard for a fancy burger. J.G. Melon for a restaurant-style burger. Shake Shack for fast-food style. Favorite Dessert: Lady M crêpe cake. 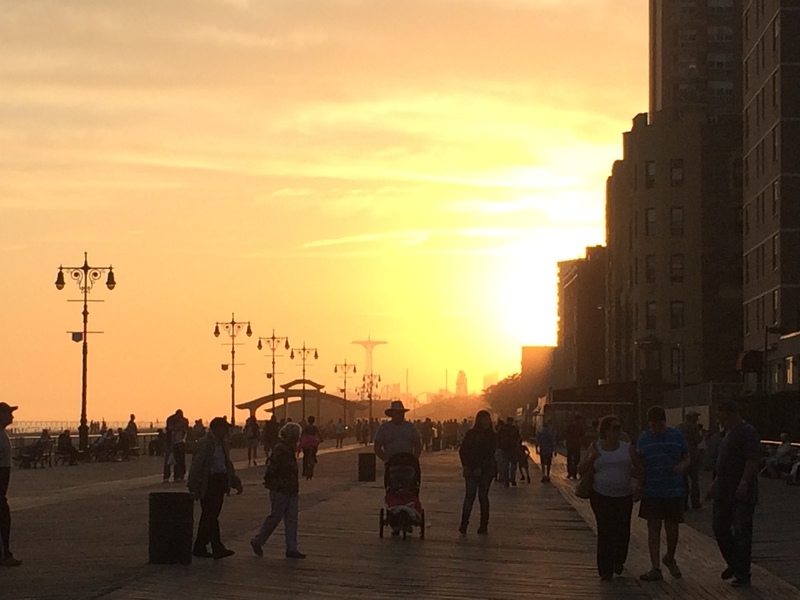 Favorite Place to Collect My Thoughts: The Brighton Beach boardwalk. Something about all those old Russians strolling near the beach makes me feel like I’m far away. Favorite Walk: Down Manhattan’s Westside waterfront, starting at Riverside Park all the way down to Battery Park. Favorite Place to Explore: Queens! There’s so much to see. I have yet to get to the Bukharian Jewish enclave of Rego Park. It’s the place to eat one of these. Favorite Restaurant in the Neighborhood: I love the ramen at Prospect Heights favorite, Chuko. James, a modern American restaurant in the same ‘hood, is a close second. Favorite Bar in the Neighborhood: The Double Windsor in Windsor Terrace. They have good beers, a tasty dark-and-stormy cocktail, and a chill, neighborhoody atmosphere that’s not too divey. Perfect Day in the City: It’s almost unfair to try and pick a perfect day–there are so many directions in which the day can go! 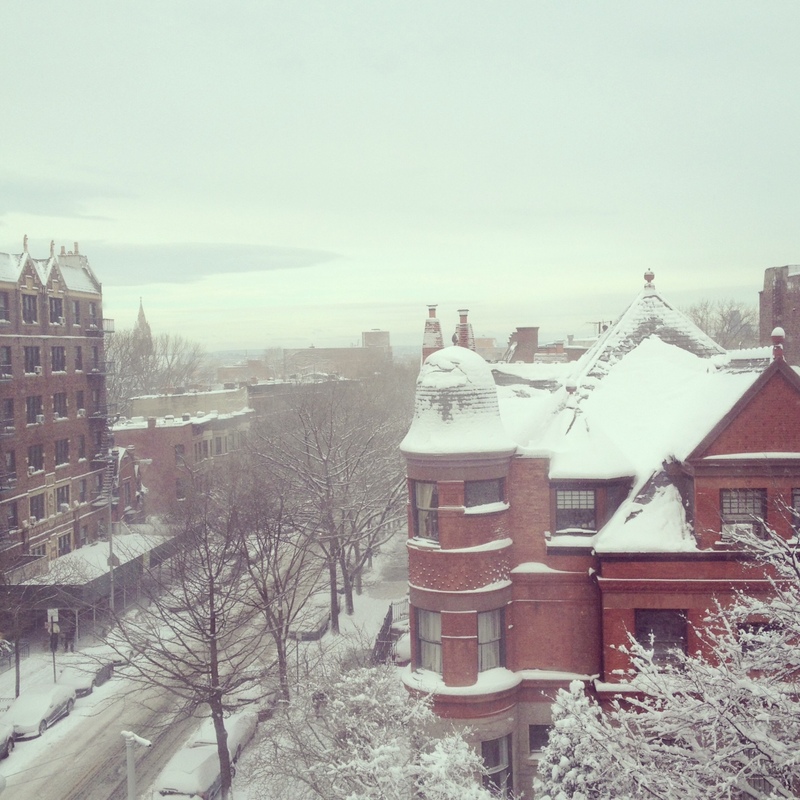 Different “perfect days” can be suited to fit a particular mood or season. The following, though, would be a great Manhattan-centric summertime itinerary. Homemade bagel sandwiches (smoked salmon from Blue Apron Foods and bagels from La Bagel Delight, both down the street from our apartment) then a visit to our local greenmarket followed by a stroll through Central Park and a visit to the Met or Neue Galerie. 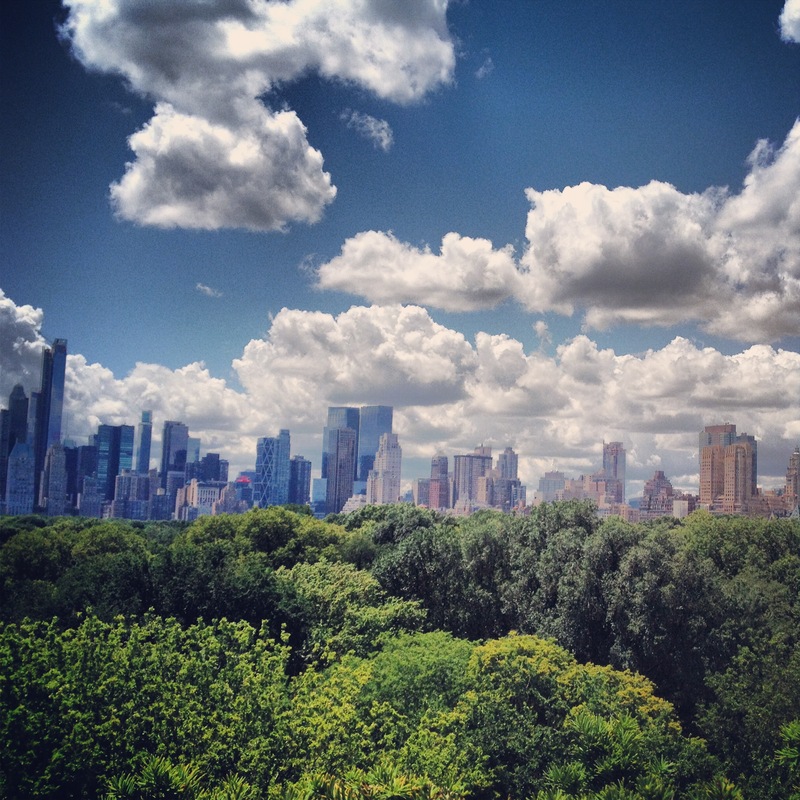 If we went to the Met, we’d grab a drink on the museum’s rooftop. Then, a burger and beer at J.G. Melon. If we’re not too tired, a leisurely late afternoon movie at classic-movie house Film Forum and a dinner adventure in Brooklyn or Queens–maybe Uzbek food in Sheepshead Bay or Greek in Astoria. Favorite Tourist Trap: I’m a sucker for the High Line. The converted elevated train track is a feat of urban design surrounded by some of the best architecture in the city. “That card lets you into a bunch of museums for free,” remarked the cashier at the BBQ place. My generic Bank of America debit card? The deal, in its 17th season, is called “Museums on Us,” and grants free access to museums across the country to all B of A cardholders on the first weekend of every month. In New York City, this means free admission to the Whitney, the Met, the Museum of the International Center of Photography and others. The program is barely advertised and the cashier’s remark was the first time I’d heard of it. But now you know, too! Take advantage this weekend. And spread the word. Filling your home with art is one of the easiest ways to make it feel lived in and personal, especially when you’re living in a cramped NYC apartment. Some people are intimidated, thinking they have to be art aficionados to do it right, so they give up and buy a bunch of generic prints at the home decor store. The truth is, you don’t need any expertise. It’s about finding something that speaks to you–whether from a purely aesthetic standpoint or because it invokes special memories–and knowing where to find it. The below tips can get you started. 1. Museum Prints: This is one of the easiest ways to bring a piece of art that you identify with into your home. It’s pretty simple. 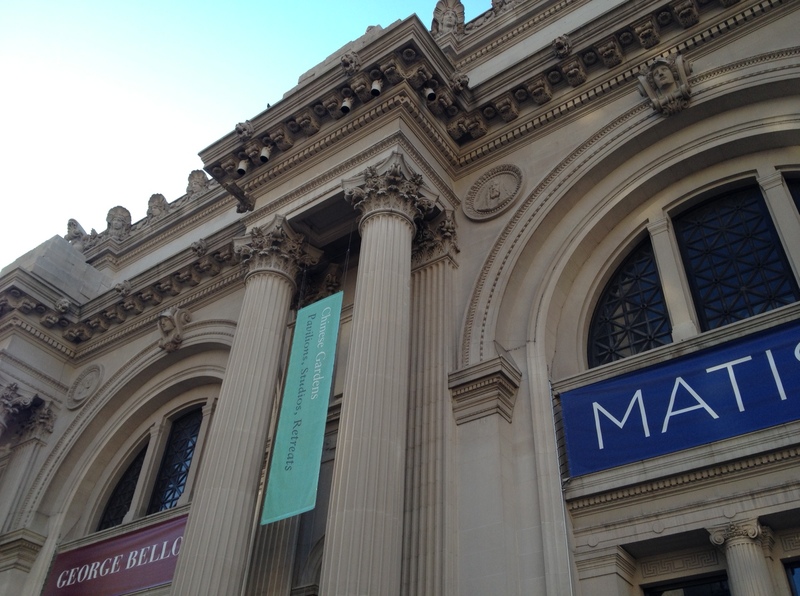 Go to a museum, either to see the permanent collection or a special exhibit. Pick out a print that moves you. Even if you’re not an art person, you can find something, based purely on color and composition, that makes you feel excited or conversely, soothed. This print will be a reminder of your outing and–let’s hope–the good, art-appreciating memories it generated. Try to buy a standard size print so you can frame it yourself without having to go the custom route. 2. Postcards: No, I’m not talking about the cheesy sunset images sold at the local gas station. Instead, pick up unique postcards at a historic landmark (the National Parks Service has amazing vintage poster-inspired postcards), an aesthetically-minded restaurant (some will give you a card at the end of a meal) or from an antiques mall (there’s one somewhere near you, I bet), which is bound to have striking vintage postcards of the local area. These can be hung, either in glass or a proper frame, and displayed in a narrow space or as part of a gallery wall. 3. Mementos: Almost anything with a flat backing can be hung, whether in a frame or not, including mementos from nearby excursions or faraway travels. Display interesting menus, decorative plates, beautiful greeting cards, book pages and drawings. A few years ago, Domino magazine featured someone who framed an elementary school punishment where she had to write out an “I will not…” phrase on lined notebook paper. 4. Vacation Photographs: Yes, go ahead and frame that striking picture you took of Victoria Harbor in Hong Kong. But even if you haven’t traveled extensively, or you have but only retained badly lit, blurry photographs from the trip(s), you can still fill your home with images of your favorite places. Etsy is a great place to start, whether you’re looking for images of Washington D.C. or Waimea Caynon. There are thousands of photographers selling prints showcasing every conceivable destination. You needn’t have taken the actual photo for it to mean something. 5. Posters: Nothing turns an apartment into a dorm room quicker than a poster hung with sticky putty. But this doesn’t mean that posters should be entirely off limits. A framed concert poster from a show you recently attended or an old movie poster can look really modern. If you really really want to showcase your love for Pink Floyd’s Dark Side of the Moon, how about ditching the student union-purchased poster for the framed vinyl album cover? 6. Something with a Sense of History: I love walking into a home and seeing old family photographs decorating walls, bookcases and mantels. Something with history, including vintage photos, old maps and historic prints can ground a space and make it feel more lived in. 7. Original Paintings: Say you’ve moved up to the big leagues and want to fill your home with actual art that an artist, working in a studio, with brushes and paint and everything, produced from scratch. Picking just the right piece can be daunting, but this list from Apartment Therapy of 10 websites that feature original work can help narrow down the search. No, these aren’t cheap, but some would argue that original artwork is most definitely worth the price of that nightstand you just bought. If you’re buying the work of an unknown artist, chances are your painting probably won’t appreciate in value all that much, but there is something to be said for simply owning a tangible piece of art, especially if it’s a piece that speaks to you personally and that you can admire and enjoy for years to come. 8. Play with Variety: This may just be personal preference as opposed to a design tenant, but I most enjoy a room filled with a hodgepodge of artwork, both in terms of genre (abstract paintings, drawings, photographs, prints, portraits) frame styles (gold, black, metal, glass, thin, thick, beveled, flat), shape and color. I especially find that doses of unexpected color, like peony pink or a shimmery aqua, when paired with black-and-white and soothing pastels, can make a room come alive. Mixing up the way you display is also important. Unless pictures are part of a series, if they’re all surrounded by white matting a room begins to look monotone, and you engage less with the actual pieces of art. Try hanging some works without matting or without a frame altogether (metallic push pins work well). 9. Play with Scale: For the same reason an all-black-and-white print wall can look flat, so can a room filled entirely with similarly proportioned pieces. It can create a staged effect, as though the area is a showroom and everything was bought the same day at the same place. People tend to be wary of oversize pieces, but they can function as the anchor of a room when paired with smaller works of various sizes. 10. Sculpture: Art is more than a painting or a photograph. It can also be something three-dimensional and tactile. Bookends, paperweights and vases are great sculptural additions. Random quirky objects like this starburst statue can also add an element of unexpectedness. A few examples from around my and my husband’s apartment. Clockwise from top left, the lead image from 2011-2012’s Brooklyn Museum exhibit, “Youth and Beauty: Art of the American Twenties.” A postcard of Grand Army Plaza, purchased from Whiting’s Old Paper in Richmond, VA. An oversize original watercolor abstract painting hanging above our sofa; made by a good friend. The menu from Hemingway Bar at The Ritz in Paris. If celebrity spotting were considered an art, I’d be a modern-day Picasso. Well, at least a young Picasso before his Blue Period. There’s no way for this to not sound like bragging, but I’m good at. Really, really good. It’s one of my few natural talents. While out and about in New York City, I’ve spotted everyone from the can’t-miss (Lindsay Lohan on Central Park South) to the pretty famous (Josh Brolin in line to get into Book of Mormon) to the you-know-you-know-him-from-something (Victor Garber in front of The London hotel). And then there are the spots of people who just happened to have been on TV: Justin Deabler from The Real World: Hawaii at our local gym and a girl from an episode of Say Yes to the Dress at a dance performance. After nearly a decade of spotting, I think I’ve come across a locale that, if frequented often enough, is likely to result in a sighting (warning: sightings not guaranteed). Behold, the bar stools facing the window at Taboonette, a tasty Mediterranean sandwich shop. My husband and I were here for a late lunch on a Saturday afternoon. About 10 minutes into our pitas, I spot Dylan McDermott walking past. At this point I utter the words: “I bet this is a great celeb watching spot.” My rationale for this was: Though celebrities tend to live in West Village, Tribeca, Nolita, Chelsea and even Uptown, many are concentrated in Greenwich Village, along those gorgeous blocks off Fifth Avenue below 14th Street. 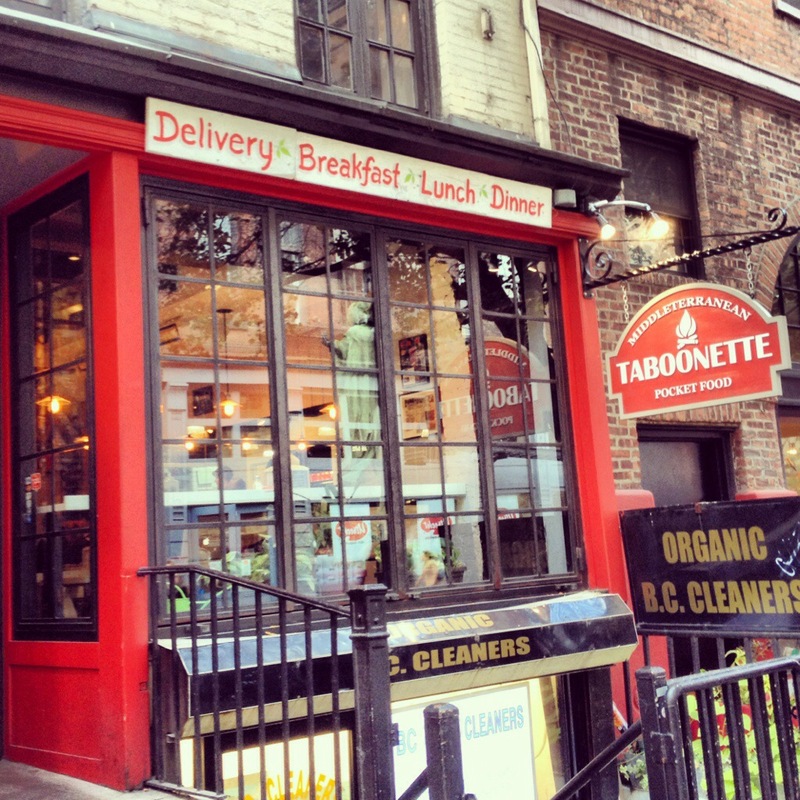 Taboonette is on 13th Street between University Place and Fifth, a prime artery of this neighborhood, especially if one wants to avoid Union Square. Know when to go. You can’t just go any ol’ time. Celebrities are migratory creatures. They tend to avoid the city during deep summer, deep winter, long weekends, award show weekends (those taking place in LA), etc. Be observant. I’m an observer by nature. I’d never walk down the street listening to music because I’d be too nervous I’d miss a bit of excitement. I use the city streets to tune in, not zone out. It’s hard to recognize anyone when your mind is elsewhere. Leave them be. A familiar refrain about New Yorkers is that they’re famously unfazed. Here, unlike elsewhere, people tend not to make a big deal about anything or anyone, whether that anyone is a person dressed in a suit of garbage bags or a celebrity. When they see a celeb, most will turn their heads in recognition, make a “is that who I think it is?”-face at whomever they’re with, let the celeb pass without incident, and then compare notes with their companion. I’ve always preferred the astronomical definition of summer, the one where summer doesn’t officially end until the autumnal equinox on September 22nd. This means I can still say “this summer has been lovely so far” and “wow, what a mild summer we’re having.” There are about two weeks left to enjoy the season and cross a few summer-specific activities off the ol’ bucket list. It’s a time of sublime weather. Mild but still warm days and cool, sweater-required evenings. 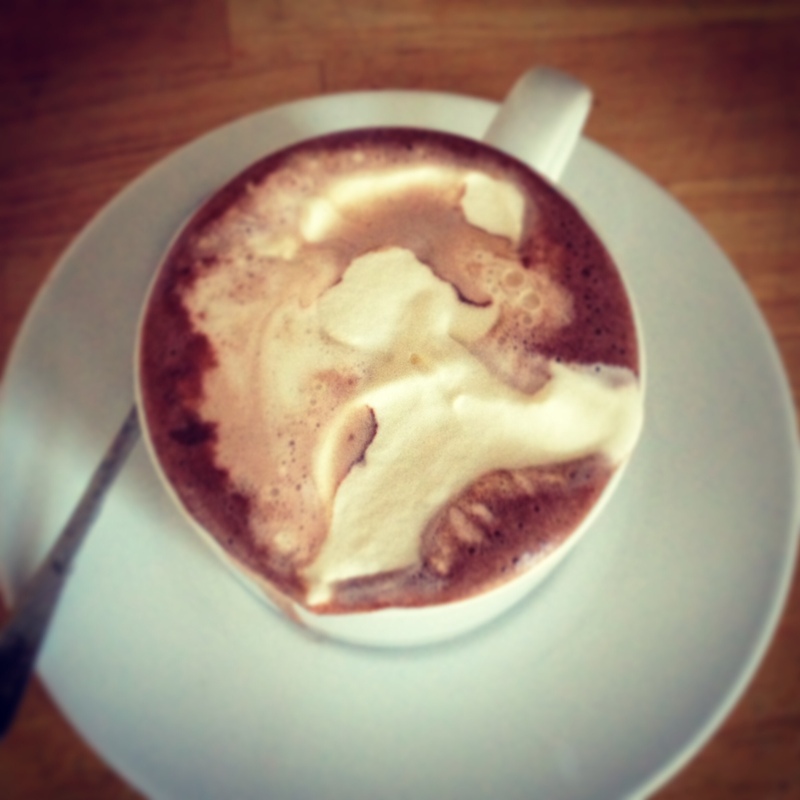 Why not take advantage with a cute sweets-and-sights date? Stop by Quality Meats restaurant on 58th Street, between 5th and 6th Avenues. Go directly to the bar and order one of their divine ice cream cakes to-go. I’ve tried the Take 6 (a variation on the Take 5 candy bar) and the Pie Flight 2013 (pictured below). They were comprised of ice cream, moist cake, cream and, depending on the flavor, chocolate covered pretzels, fruit, chocolate shavings or a mini pie. 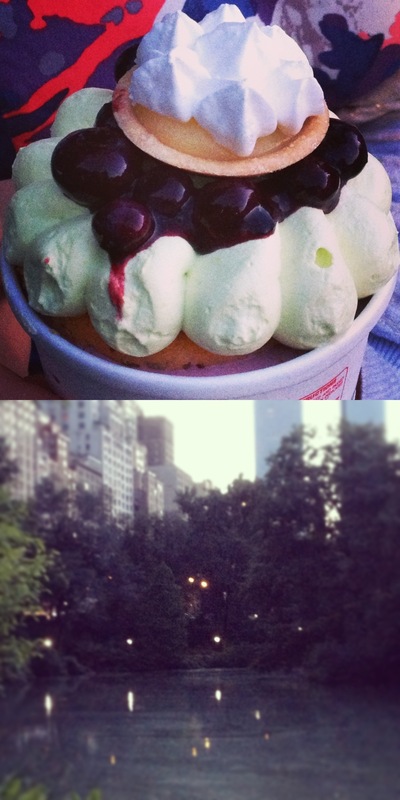 Ask for a few utensils and take the ice cream cakes to the pond at the southeast corner of Central Park (pictured below at dusk), a 5 minute walk away. Evening would probably be best time. Then revel in the deliciousness of your dessert and the magic hour-beauty of the park. Be sure to leave before nightfall when this happens. What’s a Russian supper club? For our purposes, Russian supper clubs provide dinner-and-entertainment experiences in Brooklyn’s Russian speaking neighborhoods. The food and the type of entertainment vary, though you can expect the former to be plentiful and the latter to be kitschy. Supper clubs were popular in the U.S. in the 30s and 40s, and though they’ve never quite had a true resurgence, the concept has been heartily embraced by other cultures. Russian immigrants who settled in Brooklyn’s oceanside Brighton Beach neighborhood began opening these clubs in the late 70s and 80s. The oldest examples have remained gaudy time capsules of that era. Where are they? The more established restaurants are located in Brighton Beach, with a few of the newer additions in Sheepshead Bay. I’m not Russian; should I go anyway? Do you love serviceable, sometimes delicious Russian food? Do you love fun? What about dancing? How do you feel about kitsch and cheesy entertainment? Do you drink vodka? If these bring out positive associations, then you’re in for a treat. Great! How do I pick a place? I’ve really only been to two, Tatiana, and the recently Fed-raided Rasputin. (And yes, that does make me an expert.) Though Rasputin is now, unsurprisingly, closed, Tatiana is still kicking. It’s one of the grande dames of Brighton, as is the nearby imposing National. I’d say both are good bets. Or, you can try relative newcomers Passage, Winter Garden Aqua Grill or Baku Palace. Should I come with a Russian friend? Yes, if possible. They’ll be able to explain some of the traditional dishes and translate the ridiculous songs. If anything, having a Russian speaker present will help you communicate with waitstaff and busboys, some of whom don’t know a word of English. A friend at Tatiana wanted a new glass, repeated the word multiple times and even pointed to a nearby glass as an example only to have the waiter leave flummoxed and return with an English speaking cohort. What do I wear? Your glitziest outfit. Dressing up for a Russian supper club is akin to dressing for a night out in Vegas or Atlantic City. For the ladies, anything short, tight, sparkly and designer label-clad. For the gentleman, a suit sans tie. If you have a gold chain necklace, all the better. I guess you can wear something understated, but this is more an experience than just a dinner-and-show, why not have fun with the clothes, too? What do I bring? Liquor and wine. Enough for your entire party for the duration of the night. Many places are BYO and let you to bring in as much booze as you want. Neither of the ones I’ve been to charged a corkage fee, either. They don’t advertise their BYO policy, so be sure to call and inquire. Many also offer a free bottle of wine or vodka for every 10 people in your party. Plan accordingly. (In fact, at Tatiana, we were given TWO bottles of vodka, when we took too long deciding between the options presented.) There is absolutely no reason to pay for the overpriced alcohol. What’s the food like? Good! Mostly. You can expect lots of salads, made with eggplant, or eggs and cubed potatoes, or tomatoes and cucumbers, or chilled seafood. Also, liver pâté, baked potatoes with mushroom and shashlik skewers. Maybe some sliced meats and lox. Main courses include grilled fish, chicken and lamb or duck. Pastry and fruit for dessert. When do I go? Any time of year! Definitely on a Saturday night. Though more expensive, it’s also the most festive night. Do I make a reservation? Yes, at least two weeks in advance, and it’s preferable to go with a large party for obvious reasons. When you call, make sure to ask for a table close to the stage and for one with an unobstructed view. Also, if you opt for a price fix banquet menu, which I suggest for ease-purposes, feel free to pick the cheapest option. It will be plenty of food, I promise. In fact, our first course at Tatiana was so extensive, we were sure they’d brought out the entire menu. For a Saturday night, this option is about $100, and is $15 to $30 less if you go Friday or Sunday. When do I get there? Between 8 p.m. and 9 p.m. is probably good, though you don’t want to get there too early since the music often doesn’t start until after 9 p.m. The best part? You have your table for the entire night. What does a typical night look like? Oh, man. That’s a great question! What doesn’t happen? Cold appetizers are sitting on your table as you arrive. After you’ve been sitting a few minutes, they start to bring out the hot appetizers and offer you your free bottle of alcohol. This is a good time to crack open the vodka and offer a toast. You can toast to anything: friends, family, a guest of honor, if there is one. Most important, either be sincere or sound sincere. It doesn’t really matter in this context. Low-tempo music is being performed on stage. At Rasputin, it was a Kenny G-type on a sax with long, bottle-blond wavy hair. 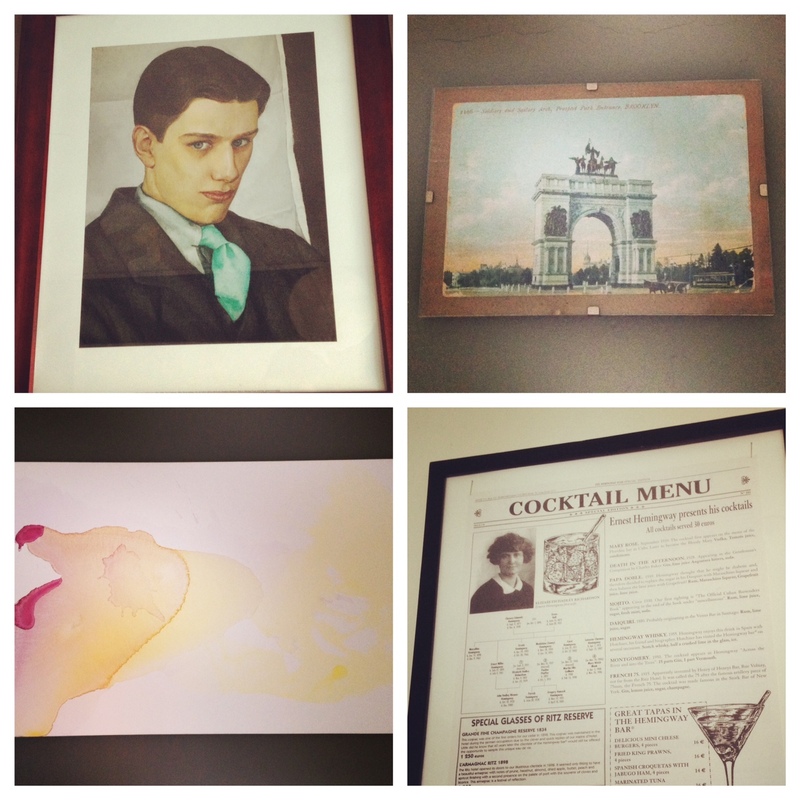 At Tatiana, it was a guy singing Jason Mraz. This is a good time to get in an awkward slow dance. Around 9:30 or 10, the music ramps up, with renditions of 30-year-old Russian pop songs (as in, my mother, who left Russia in 1989, and does not keep up with the country’s current music scene, was happily mouthing the words to every single song) or American Top 40 classics from 5 years ago. There are usually back-up dancers or singers involved. The kitsch-o-meter is definitely rising. Around now, the main course is being brought out. They do something special at Tatiana, which is, when it’s your birthday, they call you and your entire party out to the dance floor, so you can blow out the candles on your cake. A photographer then takes a ton of pictures, which he’ll offer to you at the end of the night for a a pricey $15 per photo. (It will seem like a good deal at the time.) Our party had a modest cake, but everyone had over-the-top fondant creations. Shell out for a nice cake if you want to compete. It’s all very Bat/Bar-Mitzvah-esque. In the best possible way! And now it’s time for the show. At Rasputin, it didn’t start until 11:30, but at Tatiana, it got under way closer to 10:30. There is dancing! There are ridiculous costumes! There are mediocre acrobats! There is a woman in a box being stabbed with a flaming spear! It’s silly and cheesy and all-around awesome. Don’t be a cynic–just enjoy yourself. A few highlights: At Tatiana, a group of male dancers broke into a Fiddler-style wine-bottle-on-your-hat-dance, complete with faux Orthodox garb and stick-on peyos. At Rasputin, the female dancers started the show dressed as Eiffel Towers. There might be a lull in the music around midnight, but don’t worry, it’ll pick back up! 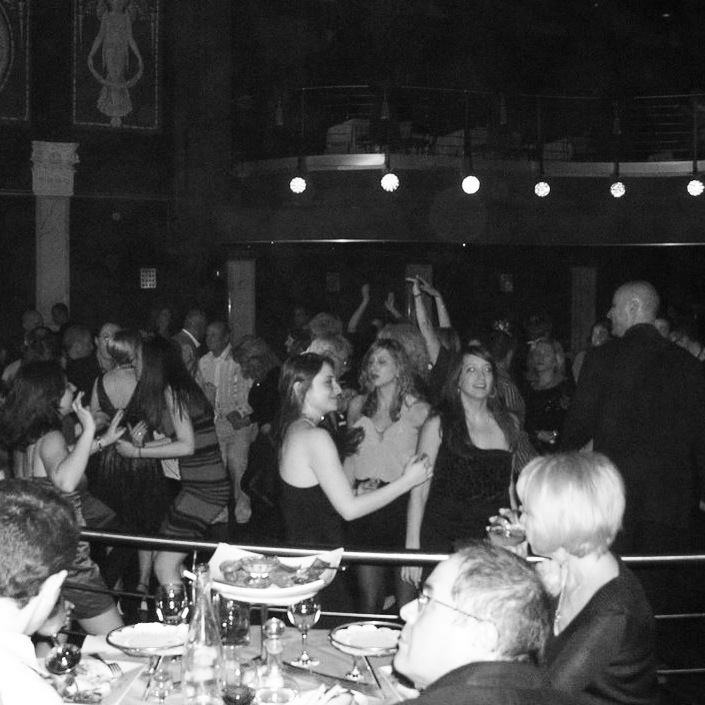 At both Rasputin and Tatiana, we left around 2 a.m., with the music still thumping. That was fun, now how do I get home? I know, right? That was crazy! There will be well-priced car service sedans idling outside as you leave. Yes, the city has its glorious sprawling greens, its Central Park and its Prospect Park and its Flushing Meadows Corona Park. Sometimes, though, you want a small canopy of trees under which to eat your lunch. 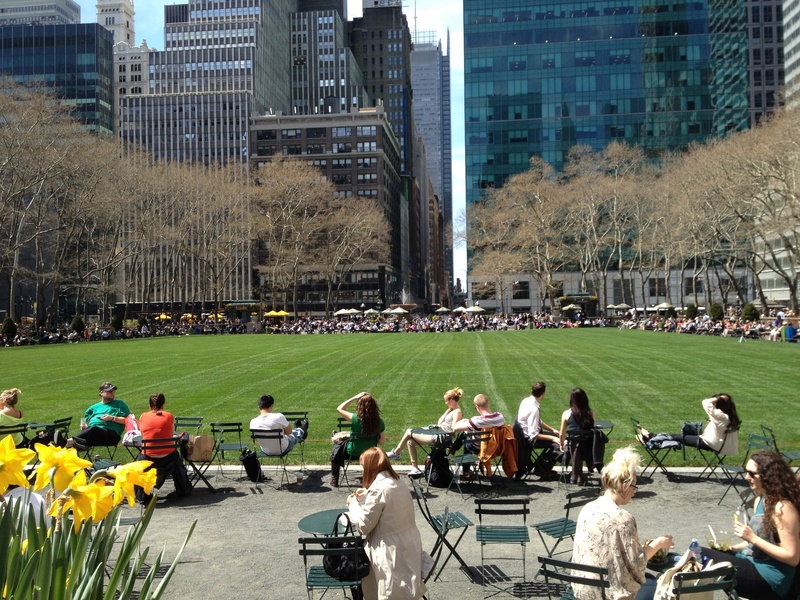 Bryant Park is this place. It’s nearly one avenue wide and two city blocks long, and for Midtown, it’s an oasis. This point is hammered home by the glass skyscrapers that surround the park, lending the manicured square an almost futuristic, Utopian quality. 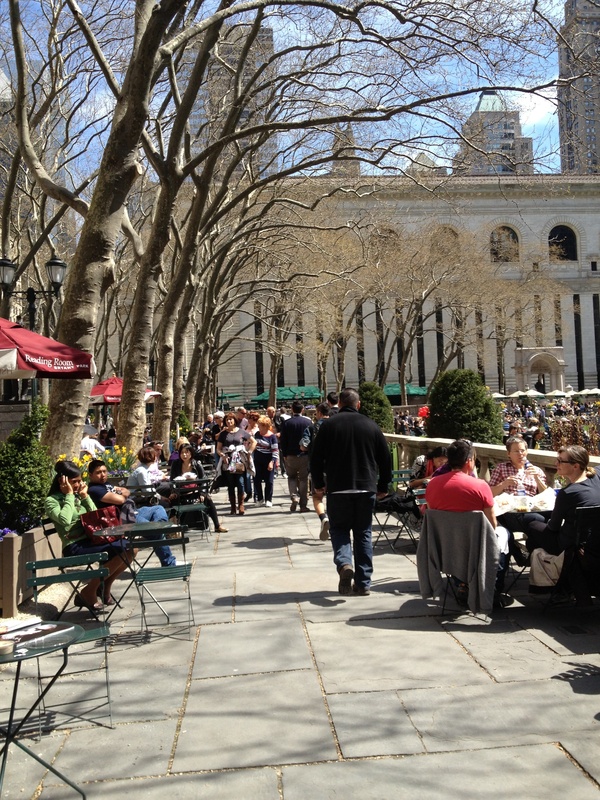 During prime lunch hour on a warm, sunny day, prepare to hunt ferociously for an open table as you compete with masses of tourists and thousands of office workers. Don’t get discouraged–there’s a lot of seating and turnover is high. And it’s not just a place to eat your lunch. 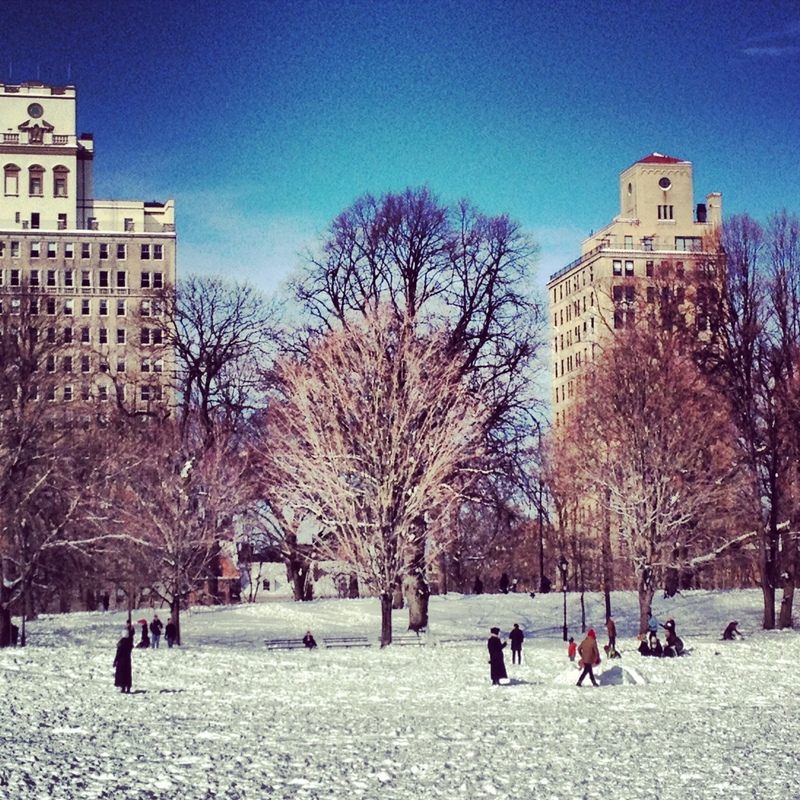 The park’s management keeps it buzzing with activities: ice skating in the winter; a holiday market; summer movies; chess; backgammon; ping-pong; a lending library; bocci; a carousel for the kids. ‘Wichcraft, spread out among multiple kiosks inside the park, has great soups, salads and sandwiches, but what I really love are their chocolate chip scones. Grab one and revel in the urban sunshine. A blog can incite an intense comment flame war just by posting a “Top Bagels in NYC” list. See here and here. I’m not going to do that (at least not yet). What I’m focusing on today is how to get a good bagel near wherever you are, because not all of us having the energy for a bagel pilgrimage first thing on a Saturday morning. 1. Scout out a decent bagel place close to your home. It doesn’t have to be the best, just good. Do a few minutes of research. You don’t want to be at the worst place when the pretty good place is just as close. 2. Ask for what’s warm. Seriously, this is so crucial. A fresh bagel will always be better than one that’s been sitting around since 6 a.m. Figure out your top three bagels. Yes, maybe you’re a die-hard everything bagel guy, but have a few backups, in case the top choice is stale. If you love everything, poppy can be a good substitute, as well as garlic. People always go to sesame, but I find it often lacks flavor. 3. Ask for your bagel “well-baked.” I’ve actually never seen anyone else do this, but it is so important. If they don’t understand what that means (though really, they should), explain that you want a “dark” bagel in the basket of fresh bagels. The key to a great bagel, in my humble opinion, is the contrast between a dark, crunchy exterior and a chewy, doughy-but-not-too-doughy interior. You’re not going to get that with an undercooked bagel. I’ve gone to some great bagel places only to find they’ve given me the lightest bagel in the batch. When a bagel isn’t toothsome, you feel as though you’re biting into a mound of dough. Below are two bagels from the EXACT SAME BAGEL PLACE. 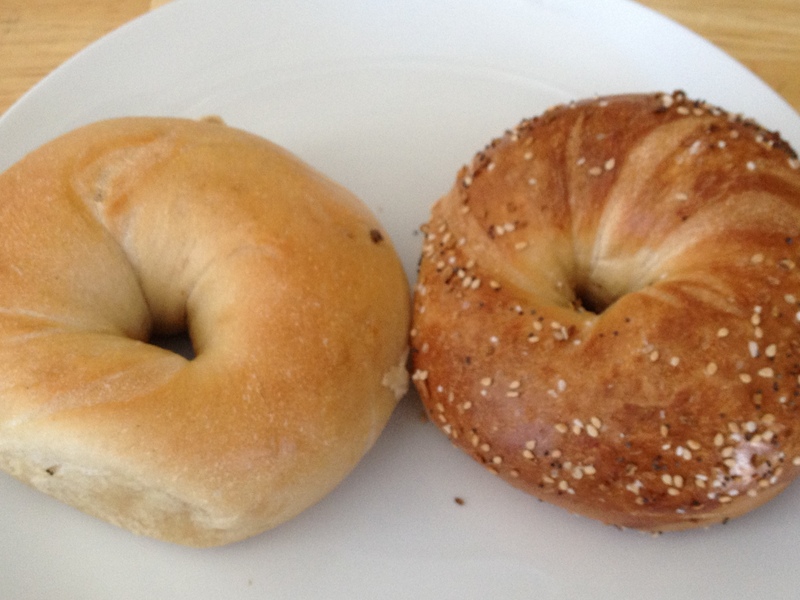 The bagel on the left is passable, fine. The bagel on the right is a dream. And let me be clear: This is very much a neighborhood place, not a destination. But an incredible bagel is still possible, if you know how to order! 4. Check out the lox before you place your order. Is it pre-sliced and a little too orange? Go with lox spread. A lox sandwich in this city is way too expensive (up to $10) for you to be paying for mediocre and often just-plain-bad lox. Also, this may not be for everyone, but my husband and I like to have good smoked salmon on-hand at home so we can make our own bagel sandwiches, which, if I may brag, rival those at Russ & Daughter’s. Sidenote: I’m not going to get into the “are bagels are getting too big?” debate. I like bagels of all sizes, though it’s true that when they’re smaller, they’re more manageable. But hey, I won’t throw a flavorful large bagel out of bed, or more accurately, my mouth.